© 2015 by The York Daily Record/Sunday News. Northeastern’s Josh Freeze performs a dive during the 36th annual South Western Diving Invitational on Saturday, Jan. 3, 2015, at Emory H. Markle Intermediate School. Chambersburg’s Nick Cover bested the meet and pool records with a diving score of 471.95, while South Western’s Andrew Feeser took second with 351.85 and Northeastern’s Joe Writer won third with 289.95. © 2015 by The York Daily Record/Sunday News. 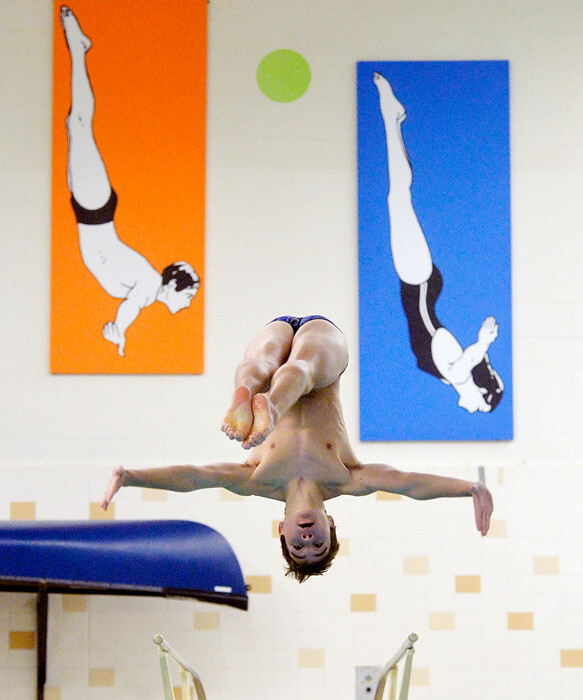 Dover’s Jamie Kohler performs a dive during the 36th annual South Western Diving Invitational on Saturday, Jan. 3, 2015, at Emory H. Markle Intermediate School. © 2015 by The York Daily Record/Sunday News. Chambersburg’s Nick Cover performs a dive during the 36th annual South Western Diving Invitational on Saturday, Jan. 3, 2015, at Emory H. Markle Intermediate School.